Where is the old Towash grist and flour mill? That’s my mystery. Local rumor and myth is that is one of the best holes for big bass on Whitney Lake. I have been searching for a map that will help me locate it. Towash, pronounced Tow-ash as in OW! with a T in front and ash as in Ash tree. I made the mistake of going into the Whitney Museum and asking if they had any information on “Toe-wash”… the lady there says “You are a stranger aren’t you? You are not from around here.” But, the upside was she apparently likes strangers who are interested in the history of the area and she was most helpful. She had lots of great information. I learned that Towash was named for Chief Towash of the Ioni tribe who lived on the Brazos. One of my favorite movies is “The Outlaw Josey Wales.” I have watched it many times and nearly have all the lines memorized. About 10 years or so ago, I finally bought the book the movie is based upon, Gone to Texas by Forrest Carter. The story of how Clint Eastwood came to choose the book for the basis of a movie is a good one too, but you have to do your own research to learn that story. At any rate, if you are familiar with the movie, Josey, Lone Watie and Little Moon arrive in Texas and make a stop at a frontier town to pickup some supplies. Josey meets the girl of his future, Laura Lee, and ends up in a gun fight with Regulators. He and Lone Watie kill several and then make their escape with Little Moon. No mention is made of the town’s name in the movie. From the book, Gone to Texas, I learn that this little town is Towash. That’s the fiction, but it is evident that Forrest Carter did some research. It was the sign on the side of Highway 933 going to Aquilla from Whitney that first caught my attention. It says “Towash Cemetery.” Then I noticed the Towash Creek sign on Highway 22 between Whitney and the dam. But, it was the book’s mention of Towash that made me begin my research. Strangely enough, the book is based a lot on the facts according to the old news reports, genealogy papers, and even some Texas Legislature documentation the museum has accumulated. News paper articles came from the Whitney View, the Whitney Messenger, and the Whitney Star. This is an artist’s rendition of the mill. 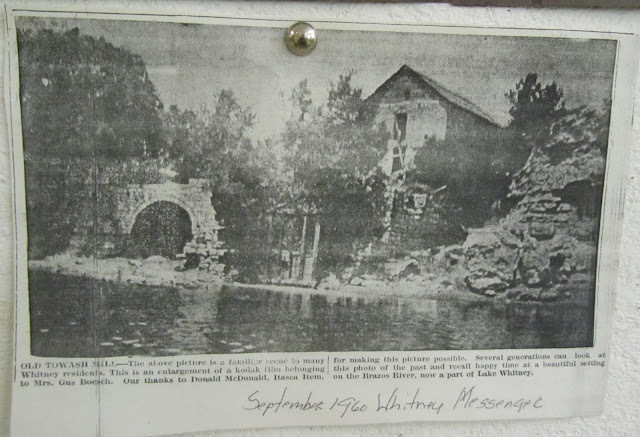 This is a picture of the old grist and flour mill originally built and operated by the Dyer brothers, Simpson Cash Dyer (known as S.C.) and James Harrison Dyer who petitioned the Texas Legislature to dam the Brazos river. to furnish more power for their flour and grist mill. They did receive that charter in 1857 or 1858 with the conditions that the dam not become a public nuisance by producing stagnant water or disturb the navigation on the river. I am guessing that the “disturb the navigation on the river” condition has gone by the by now. Records also indicated that a large mill-wheel of solid bronze was imported from France and brought up the river to Liberty by boat, then overland by ox-wagon. By 1860 a carding machine was added to the mill. The Whitney Museum operator advised that 8 or 10 years ago, Whitney was inundated with scuba divers who were intent on recovering the mill-wheel and selling it for scrap. Apparently, though someone else had had that idea years ago, and the wheel was not to be found. “S.C. Dyer, who ran the mill until his death in 1876, closed the mill from midnight Saturday to midnight Sunday. More than 50 people were regularly employed at the mill. This is a picture of the Towash Church that S.C. Dyer built. The church was built of cedar logs and reinforced with clay. I believe that the church has likely disintegrated some years ago. In fact, I heard that some locals were recently riding the lake bottom in the Towash area and came across the old Towash Cemetery which was supposedly moved by the Corps of Engineers before the lake filled. According to their story, there are still headstones standing that have legible information on them. The bottom line is, I haven’t found a map that shows where the old mill is in Whitney Lake. Some folks say that with this recent drop in the water level at Whitney Lake, some parts of the old ruins of the mill are visible or near visible. I want to find this mysterious place and see if the myths of huge bass can be validated.